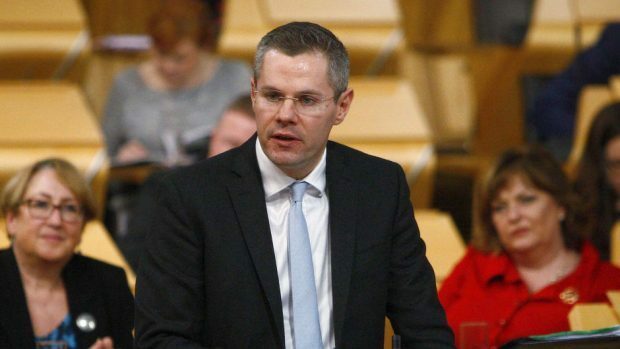 Derek Mackay has accused the UK Government of sitting on billions of pounds of spare cash that could have boosted the economy, public services and WASPI women. The SNP finance secretary refused to welcome Chancellor Philip Hammond’s Budget as he updated MSPs yesterday, it being worth £950million extra for Scotland by 2020/21. He insisted the package actually delivered a £59million shortfall on promised NHS spending, and a real-terms cut in spending for the rest of Scotland’s public services. But Tory MSPs challenged Mr Mackay to use his own financial statement in December to pass on more than £40million of additional spending to boost Scotland’s high streets and fix potholes. Mr Mackay added: “The chancellor could have gone much further in stimulating the economy, giving justice to the WASPI women and investing in public services, and he could have done so while staying within his own fiscal mandate and his own fiscal targets. “According to the Office for Budget Responsibility, he had fiscal headroom of about £15.4billion. He has chosen to keep that in reserve rather than to spend it in a way that could have done those things. During Monday’s Budget, several MPs applauded protests from the Women Against State Pension Inequality (WASPI), who were born in the 1950s and have been disadvantaged by rises in the state pension age. Conservative MSP Dean Lockhart said: “Despite what we have just heard, the UK Budget delivers for the people of Scotland. “Yesterday, the cabinet secretary acknowledged that the Scottish Government’s future budget will increase as a result of the UK budget.